If you are currently looking for a single cup coffee machine, you won’t go far wrong with the Keurig K55. We tried and tested hundreds of different models as part of our research into the best single serve coffee makers around, and we named this machine the best of the best. This means the machine is a great all rounder – it’s easy to use, the coffee tastes good and its good value for money. How Well Does T﻿﻿his﻿﻿ Machine Work? Who is this machine ideal for? Who isn’t th﻿is machine for? 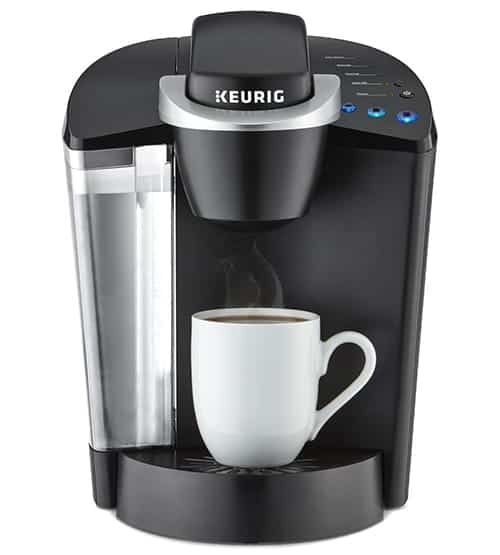 The Keurig K55 is a pod coffee machine, which means it’s really easy and convenient to use. Simply insert the K-cup pod of your choice and away you go! If you prefer to brew freshly ground coffee, you can purchase a reusable K-cup pod and fill it with your own ground coffee for a better all round flavour. The large water reservoir holds 48oz of water meaning that you don’t have to constantly to refill it between cups. It is also removable so when it is time to fill it, it’s quick and easy to do. Options for multiple brew sizes (60z, 8oz and 10oz). This means you can choose the size of the cup to match your taste. For example, if you like your coffee strong, you can choose a 6oz cup. If you like it weaker, choose the 8oz etc. Brews in under a minute. This is ideal of you’re in a hurry! Auto-off feature. This feature can be activated so if you forget to turn your machine off, it will shut off automatically after two hours to save you power and therefore money. Removable drip tray. This feature has two great uses. Firstly, it makes cleaning the drip tray easy. Also, it means you can choose to use a larger cup size than the standard cups by removing the drip tray. You then have the option to double up your pods for a longer drink. A three or four years extended warranty for a small additional fee. Keurig stainless steel travel mug. For taking your coffee on the go! Th﻿is﻿ machine is so simple to use. Simply insert a pod and choose your size. Press the button of your chosen cup size, and that’s it! You can also easily turn the auto-off feature on and off with the single touch of a button. Once you have set this once, the machine saves it so you don’t have to keep doing it every time you use the machine. One of the things we really loved about this machine was the ability to make different drinks (jumping from coffee to tea and back again) without having to clean the machine in between. There is no lingering taste of the previous drink. Is there anything we didn’t like? Not a lot! We think the disadvantages are really not that big a deal when compared to the advantages, but if a large, strong cup of coffee is important to you, then do bear this in mind. This machine is ideal for anyone who wants an easy to use machine that produces a good cup of coffee every time. It’s ideal for hassle free coffee. Who isn’t this machine for? This machine, like all pod machines, aren’t for anyone who likes coffee house style coffee. Although the coffee tastes quite good, it won’t taste the same as your daily Starbucks fix! This particular machine isn’t suited to anyone who likes a large mug of coffee unless you are willing to run two pods through per cup. Overall, for the price and ease of use, you won’t find a better pod machine than the Keurig K55. It’s guaranteed to take the pain out of using a machine with it’s one touch programming and fast brewing. We reviewed the Keurig K55 single serve programmable K-cup pod coffee maker in-depth and here are the results. How tall of a cup will fit under the drip? My dad has his favorite insulated sipper.